Can't get enough of the great outdoors? Check out this fantastic 3 lane camo obstacle course! Over 62 feet in length and 3 lanes wide, this inflatable has a unique and clean design. People will be able to race through it faster while testing their strength and agility. Complete with low tunnels, pop tubes, hurdles, a climbing wall, and a steep slide this is the perfect way to have friendly competition and enjoy every second of it. Above the obstacle course is safety netting, so when you're having the time of your life, the vinyl will stay cool during the hot summer days and you can keep racing through for as long as you can! 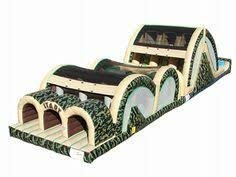 Rent this 3 lane camo obstacle course inflatable for your next big party or event so both kids and adults can make the most of their summer days.